Words are extremely powerful. You can use them positively as words of encouragement or if used poorly, they can be destructive and harmful. And this is true for any eCommerce store, words can directly impact your customer engagement, conversion, and your overall bottom line. Today, you will learn how you can transform words into powerful contents — writing product titles and product descriptions that can help you persuade your online shoppers into their path to purchase. The quality of how you construct your product title and product description can definitely make or break a sale. Why Product Titles and Descriptions are Important? In your product pages, you write for people. The main reason why you write product title and description is simply that people can use them to decide what products to buy. So if you write confusing or complicated product titles and product descriptions, you might be jeopardizing your sale. In fact, 20% of purchase failures are caused by missing or unclear product descriptions. Moreover, if you write quality product descriptions, you can potentially increase conversion rates by up to 78%. If you invest in writing your own unique and quality product titles and product descriptions, you are supporting your SEO practices too. Search engines love fresh and unique contents. If your products share the same product titles and descriptions, how will search engines distinguish one from the other? How to write an effective product title and product description? Remember, you want to craft quality product titles and product descriptions because you want to help your customers look for the right products and persuade them, eventually, into a purchase. The foundation of a good product name and product description starts with your core: your customers. You should write in a manner that resonates with your target audience. Write in such a way that they understand. Your brand should be reflective of who your target audience is. The best advice is to copy how they write and talk in a normal conversation. What kind of word does your target audience would appreciate? How would you speak to a customer in a face-to-face interaction? What words are your shoppers using? Try to incorporate their language and words into your product copy in order to get their attention and to convey your message more resoundingly. Who is your product made for? A target audience can be a generation (millennials, generation z), a gender (men or women), a marital status (head of household, spouse) or a specific demographic for a group of customers. 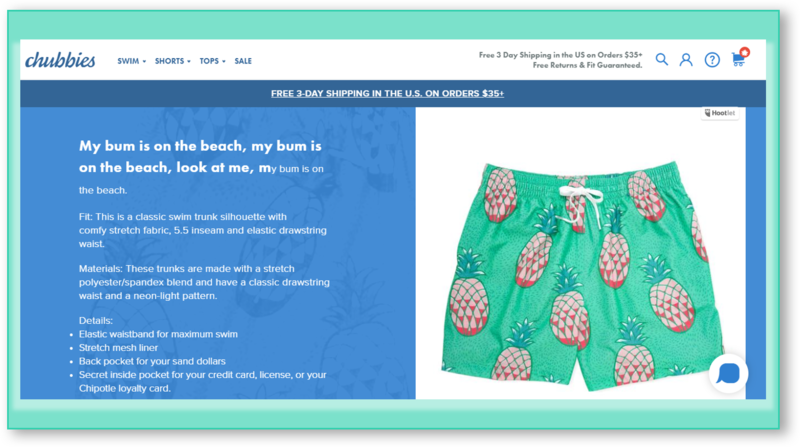 When you understand how your target audience acts or behaves, you can invoke your product titles and descriptions more clearly and more effectively just like how Chubbies crafts their product titles and product descriptions in a clever and humorous manner that mirrors their millennial target market. You need to make sure that your products are properly named and formatted accordingly. This will increase the probability that they will be discovered by customers. The more people discovering your products, the higher the possibility of resulting in sales. But, we are not only talking about search terms or keywords here. 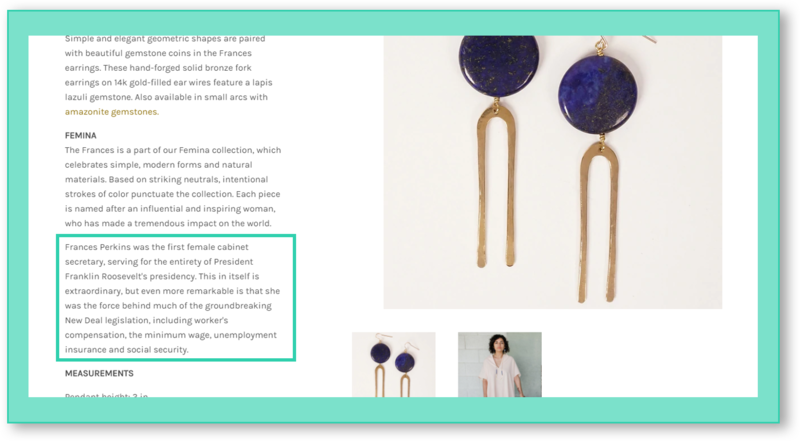 In a study conducted, the formatting of your product description will influence the perception of your shoppers toward the product. However, the rule of product description formatting varies depending on the product category. In summary, the results suggest that a paragraph or a text format is recommended for techie products or specs-driven items like computers or smartphones. For bulleted type product descriptions, they gain more attention and people have a longer amount of time reading them compared to paragraph type. Some people say that in copywriting, the longer the better because you’ll have more words to sway your potential customers into buying. However, not all people like to read lengthy product titles or product descriptions, especially if they’re just written for no good reason. Finding the right length for a product title and product description will help you get 51% more clicks. As a rule of thumb, follow the policy requirements of where you are listing your products. For example, Amazon has a clear policy of using 50 characters maximum for product titles as a general rule. However, some product categories allow longer product titles of not more than 200 characters, including spaces. For product descriptions, you are allowed to use 2000 character with a separate maximum of 500 characters for key features. The average customer attention span is more limited and more distracting than ever. This is why in order to pitch your product effectively, you should entice your customers with the copy that will actually assist them to find the right product. And the best way to do this is to always write the features and benefits of the products. But, sometimes you still don’t know the difference between the two. A product feature is something that a product has or made of. It is the functionality that enables the buyers to do something. In contrast, a product benefit is the result that a buyer will get from using the product. What are your product’s basic attributes? Dimensions, materials, functions, etc. Why should they use the product? Would it cure a problem? How is your product better than your competitors? Would it cure a problem faster? Where could they use your product? Home or office use? Indoor or outdoor? When could they use your product? Birthday? Christmas? Summer? How does your product work? This is for technical items. Every time customers shop for a product online, they are uncertain for a lot of reasons: is the product of good quality? Is the merchant reliable? How do I know if this is the right product for me? Will I receive the product on time? Your product copy will help you answer a lot of questions in a customer’s mind, especially those that they fear and doubtful of. The reason is that shoppers will risk their money every time they shop online. The higher the item’s value, the higher the risk. You will see high-priced items like smart TVs and smartphones with lengthy and detailed descriptions. Again, because the more monetary value that a customer will spend, the more uncertainties and risks they will gamble. Your product descriptions should be able to relay sufficient information. The lack or missing information could actually prevent the customers from successfully buying the product. Whenever possible, your product title and descriptions must anticipate all questions and doubts that shoppers would encounter. As a general rule, every shopper wants to know how the product will meet his or her wants and needs. So, start thinking about what the customer desires and requires to achieve. All shoppers do comparison shopping all the time. It’s either because they want to steal the best deal or get the most suitable product. Whatever the reason is, average shoppers visit three websites before making a purchase. And this is where you get the opportunity can control the conversation. Given that people are already comparing you with your competitors, why not use your product descriptions to directly compare your product with that of your competitors? This way you can present the advantages of your product more. This is also a good way to explain your products even more. Say, for example, your product is more expensive compared to your competitor. You can include the reasons why buying a higher priced product will be more beneficial in the long run versus purchasing a cheaper alternative. Aside from directly comparing your products from your competitors, you can also use your product descriptions to compare your own products within the same product category. 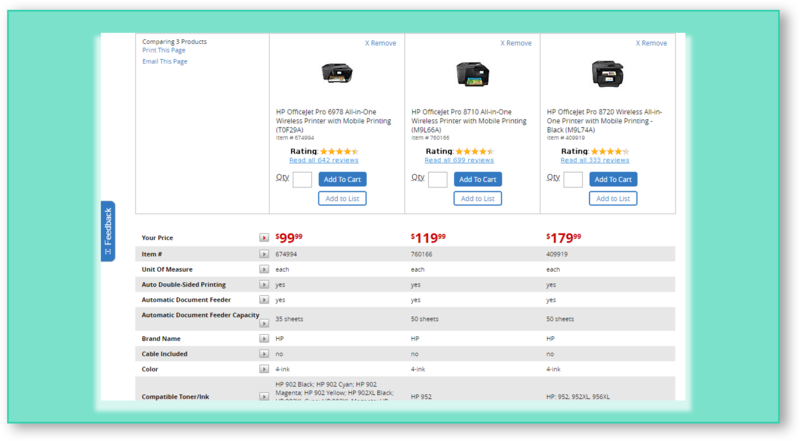 Office Depot, for instance, has a product comparison feature to quickly compare the characteristics and features of different products at the same time in a table format. If a product isn’t converting, it’s likely that your product description is not resonating on the customer’s emotional level. You want to appeal to your customer’s emotions in order to successfully convert them. This is why using emotionally charged stories can help you increase the perceived value of a product making it more viable for purchase. In 2009, a project called Significant Objects was created as an experiment. The goal was to resell inexpensive items on eBay and turn them into a profit by adding personal short stories as product descriptions. The products, bought for $1.25 apiece on average, were sold for almost $8,000 in total. This project tells you that storytelling is a powerful technique in a highly converting product description. While product features and benefits are staples in product descriptions, it is good to note that they shouldn’t be dull and boring. You can take advantage of people’s imagination and turn it into something more engaging and entertaining to read. Whenever visitors enter your online store, they are most likely unsure about what to buy. This is why they visitors seek advice from other people before purchasing a product. They’re often more inclined to purchase an item that generated a high number of positive reviews or feedback. And this is what exactly what a social proof is all about. If you put social proofs like reviews or testimonial into your product descriptions, you are adding trust and credibility to that product. That customer reviews will serve as evidence that other people have already purchased the product and they’re satisfied with it. When visitors shop at your online store, they don’t have the means to examine your product. They can’t touch or try it on. While visuals like product photos are important aspects, you’ve learned the power of writing product titles and descriptions to help shoppers look for the right products. Construct your product titles and product descriptions to resonate with your target audience, appeal to your shoppers’ emotions, and answer important questions. But more importantly, don’t forget your main objective: sell your products and drive shoppers into conversion. Hey Alice, this is a nice post – short, simple, and sweet. You have rightly pointed out the importance of bringing unique personality in the products. The best way to do is to imagine your buyer persona is your friend and use the tone of voice you would actually use when you would meet him/her. The right tone of voice connects buyers with the products, thereby increasing the chances of sales. We’re glad that you like our article! Your thoughts are precious to our team. We’ll definitely keep up the good work. Thanks!